Dr. Booker holds a Doctor of Musical Arts in Jazz Double Bass Performance from the University of Texas, Austin. He also holds a MM in Composition and a BM in Jazz Studies from Texas State University, San Marcos. In addition to Adam’s academic instruction, he also studied with Francois Rabbath, Eric Revis, and the legendary Milt Hinton, as well as members of the San Antonio Symphony, Austin Symphony and the Louisiana Philharmonic Orchestra. Before coming to Appalachian State University, Dr. Booker served as Assistant Professor of Double Bass and Jazz Studies at the University of Minnesota Duluth, where he also taught Jazz Improvisation, Jazz Arranging, Music Business, String Methods, Basic Recording Techniques, and was the Director for UMD’s Jazz Ensemble II. While in Minnesota, Dr. Booker had the opportunity to perform with the Minnesota Orchestra and the Duluth Superior Symphony Orchestra, as well as several appearances performing contemporary solo repertoire for the Double Bass for the public and students in high schools throughout the region. Adam also performed at the Bemidji State Jazz Festival with percussionist Steve Smith (Journey), and adjudicated at the University of Wisconsin-Eau Claire Jazz Festival, one of the largest competitive jazz festivals in the United States. He also served as musical and artistic director for the first annual UMD Double Bass Festival, featuring Dr. Donovan Stokes, which brought together professional and student bassists from the region for two days of master classes, clinics, and performances. Dr. Booker has also shared the stage with several of jazz's great masters, including Al Grey, Frank Foster, John Fedchock, Russel Malone, Butch Miles, Ignacio Berroa, Arthur Latin, Diana Krall, Ingrid Jensen, Christine Jensen, Bob Sheppard, and pop music icon, Elvis Costello. 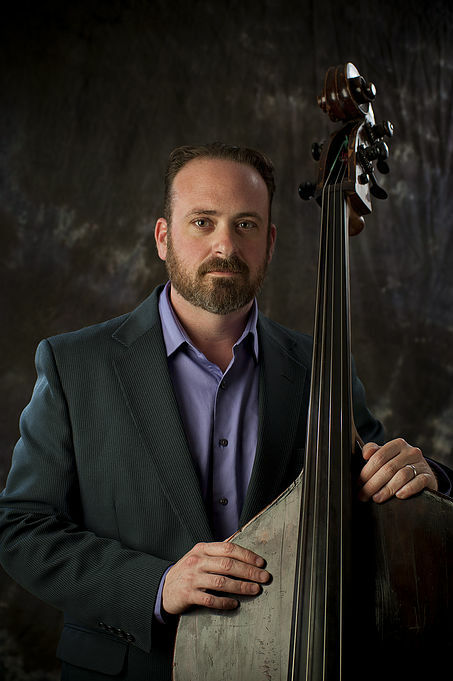 Dr. Booker has presented his research in Early Jazz Double Bass Performance Techniques, and performed at the Jazz Education Network Conference in Dallas, TX, International Society of Bassists bi-annual conference in Ft. Collins, CO, and at the 2016 European Double Bass Congress in Prague, Czech Republic. Dr. Booker is also a proud veteran of the US Navy, in which he served as a bassist for US Navy Band New Orleans until the end of his enlistment in 2005. During his enlistment, Dr. Booker had the opportunity to delve into New Orleans' rich musical culture. He became a member of The Hot Club of New Orleans, The Rob Block Quintet, and The Devin Phillips Quintet. He has performed with a wide variety of today's modern jazz up-and-comers, including Patrick Cornelius, Davy Mooney, and Maurice Brown. Upon his Honorable Discharge from the Navy, Adam returned to central Texas and became a staple in the world-famous music scene in Austin, TX, while continuing his formal education. Aside from being a sideman on numerous recordings, Dr. Booker’s first album as a leader, Unraveled Rival, was released in October of 2015 under the Shifting Paradigm Records label. Adam is happily married to Sally Booker, vocalist and pianist, with whom he also performs. They have two young daughters, Cassidy and Vivian, and their son Ronald has begun playing bass as well.